The management of hypertension in patients with chronic CAD and chronic stable angina is directed toward the prevention of death, MI, and stroke; a reduction in the frequency and duration of myocardial ischemia; and the amelioration of symptoms. Lifestyle changes and the adoption of a heart healthy approach are critical, with the usual attention to diet, sodium intake, moderation of alcohol intake, regular exercise, weight loss, smoking cessation, glycemic control, lipid management, and antiplatelet therapy. Recognition and treatment of hypothyroidism and obstructive sleep apnea are important adjuncts in at-risk patients. Pharmacological management is inevitably required. 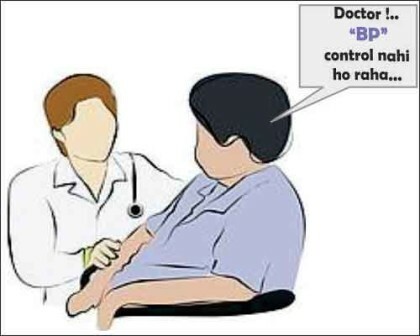 A reasonable BP target for hypertensive patients with demonstrated CAD is <140/90 mmHg. A lower target BP (<130/80 mm Hg) may be appropriate in some individuals with CAD or those with previous MI, stroke or transient ischemic attack, or CAD risk equivalents (carotid artery disease, PAD, abdominal aortic aneurysm). The mainstays of angina treatment are b-blockers, CCBs, and nitrates and for prevention of cardiovascular events in these patients include ACE inhibitors, ARBs, thiazide and thiazide-like diuretics, b-blockers (particularly after MI), CCBs, antiplatelet drugs, and drugs for the treatment of dyslipidemia. .
c) A thiazide or thiazide-like diuretic (Class I; Level of Evidence: A). The combination of a b-blocker, an ACE inhibitor or ARB, and a thiazide or thiazide-like diuretic should also be considered in the absence of a prior MI, LV systolic dysfunction, diabetes mellitus, or proteinuric CKD (Class IIa; Level of Evidence: B). If b-blockers are contraindicated or produce intolerable side effects, a nondihydropyridine CCB (such as diltiazem or verapamil) may be substituted, but not if there is LV dysfunction (Class IIa; Level of Evidence: B). If either the angina or the hypertension remains uncontrolled, a long-acting dihydropyridine CCB can be added to the basic regimen of b-blocker, ACE inhibitor, and thiazide or thiazide-like diuretic. The combination of a b-blocker and either of the nondihydropyridine CCBs (diltiazem or verapamil) should be used with caution in patients with symptomatic CAD and hypertension because of the increased risk of significant bradyarrhythmias and HF(Class IIa; Level of Evidence: B). For patients with stable angina, the BP target is < 140/ 90 mm Hg. (Class I; Level of Evidence: A). There are no special contraindications in hypertensive patients for the use of antiplatelet or anticoagulant drugs, except that in patients with uncontrolled severe hypertension who are taking antiplatelet or anticoagulant drugs, the BP should be lowered without delay to reduce the risk of hemorrhagic stroke (Class IIa; Level of Evidence: C).